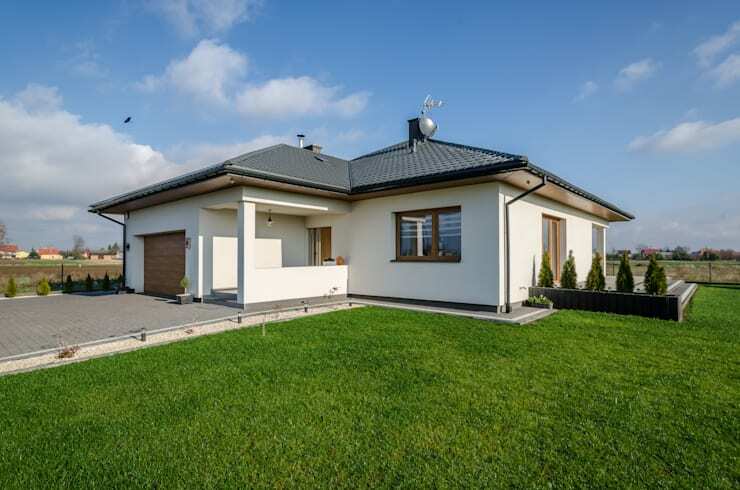 Come explore the elegant simplicity of modern architecture and design with Ariel, a comfortable and functional bungalow in Bialystok, Poland. The simple but stylish building is surrounded by gorgeous green lawns and comes with a delightful patio perfect for lazy weekend brunches and stargazing at night. Created by the architects at Biuro Projektowe MTM Styl, the abode makes use of sober and sophisticated hues to concoct spaces which are warm, cozy and inviting. 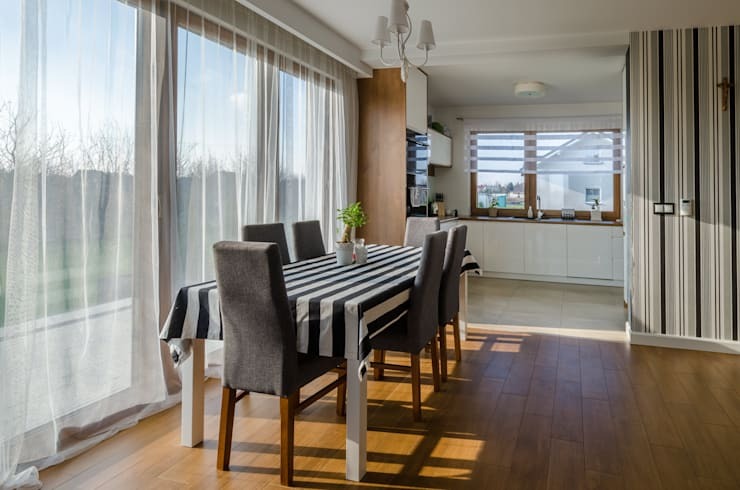 Sleek, contemporary furnishing, gleaming surfaces, large windows and doors that offer stunning views – all come together to create an urban home which is perfect for both grownups and kids. Generous doses of vibrant colours add pizzazz to the master bedroom and children’s room, while a minimalist decor scheme runs through the entire home. With grey shingles on the roofs and pristine white walls, the single story home strikes a pretty picture in the middle of lush green fields. Simple structural lines and the absence of any extra frills lend a warm and open personality to the house. Timber has been used for the doors and windows, to create contrast, while nicely trimmed bushes add aesthetic appeal to the scene. What an exciting place for kids to play around and adults to sunbathe! The expansive terrace of the abode receives oodles of sunlight and is a smart, layered affair. The roof provides ample shade to the outdoor seating arrangement, whereas the lawn is perfect for kids and pets to frolic and enjoy fresh air. 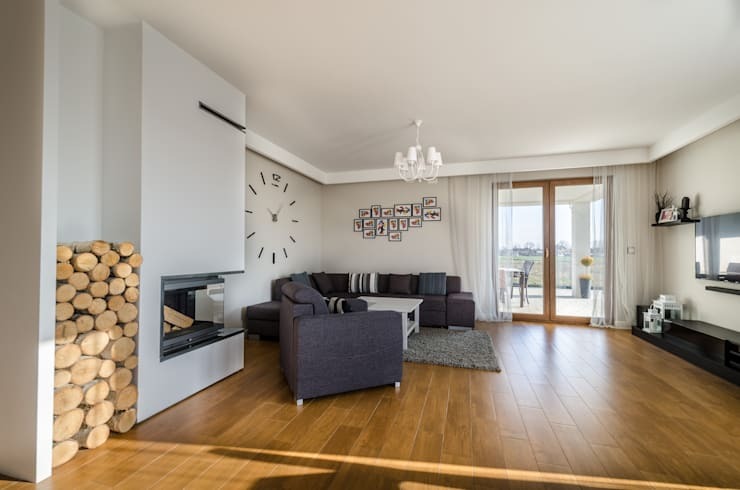 The warm wooden floor adds loads of coziness and country style charm to the predominantly white living room. The sleek fireplace comes with a smart niche on the side for storing logs, and this arrangement enhances the earthy ambiance here. Sleek grey sofas, striped cushions, a grey rug and a chic white coffee table offer a comfy seating arrangement under the pretty white chandelier. The entertainment unit is sleek too, and the trendy photo collage and quirky wall clock add visual interest to this space. The sleek and trendy dining table flaunts a cool striped cover and is accompanied by chic grey and wooden chairs for an ultramodern look here. Large glass doors bring in tons of natural light, while the sheer drapes add a hint of dreaminess to the atmosphere. The striped wall on the right that marks the entrance to the open kitchen is a fancy touch too. 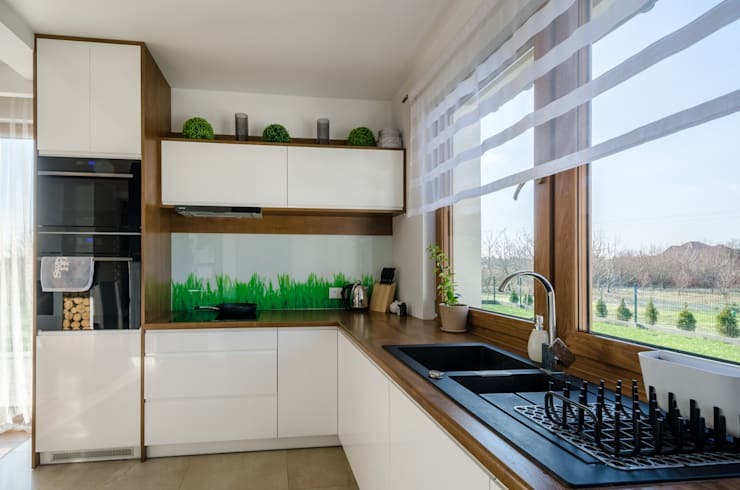 The wood and white kitchen with its sleek countertop and glossy cabinets is a very modish space which receives adequate sunlight through the large windows. The vibrant grass decal on the white panel near the window adds a dollop of playfulness to this area, while minimalistic fixtures and trendy appliances ensure smart functionality. We particularly love the sheer, striped drapes partly shading the windows for an elegant look. 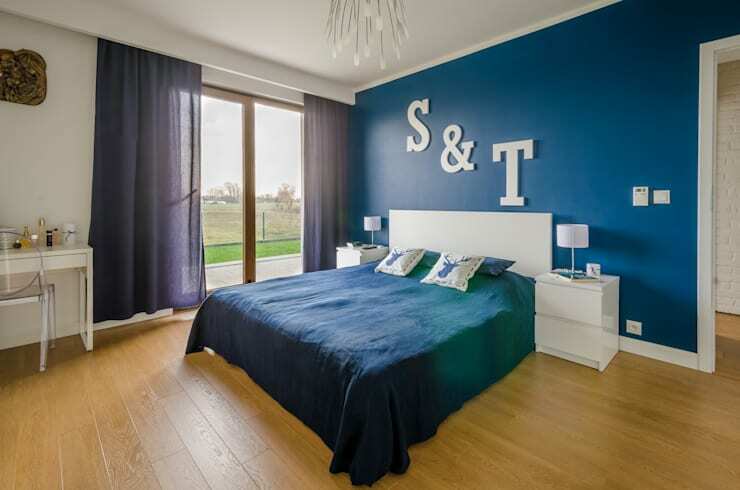 The brilliant blue feature wall in this master bedroom takes the decor scheme to a whole new fashionable level, along with the alphabetical wall art pieces. The simple white bed draws our attention with its rich blue bedding and quirky patterned cushions, while the sleek side tables offer stark contrast. Large glass doors let you soak in the beauty of nature while you are relaxing under the trendy chandelier, and the warm wooden floor contributes to the coziness factor. The drapes lend an exotic touch to the space too. 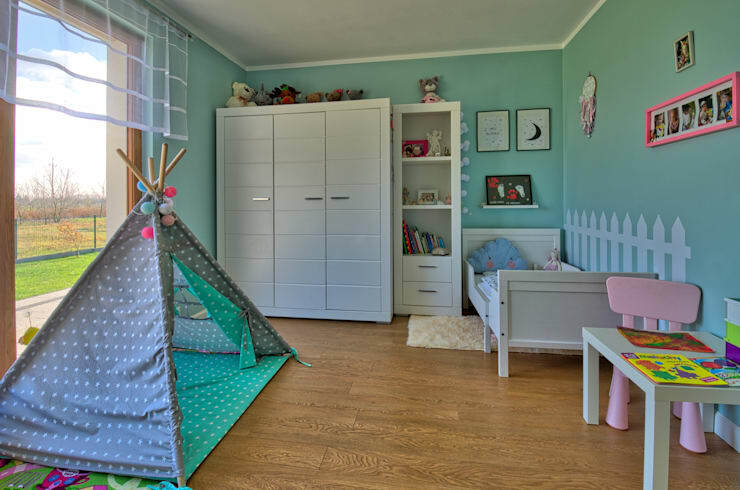 Dollops of bright but soft pastels fill the kid’s bedroom with happiness and positivity. The sea-green walls, the quaint little bed, the white picket fence painted on the wall, the bubblegum pink chair and the polka-dotted tent make for an ambiance that is intensely imaginative and creative. Photographs, artworks, toys and a highly utilitarian closet complete the look here. And thanks to the large glass doors, the room stays sunny and full of life throughout the day. 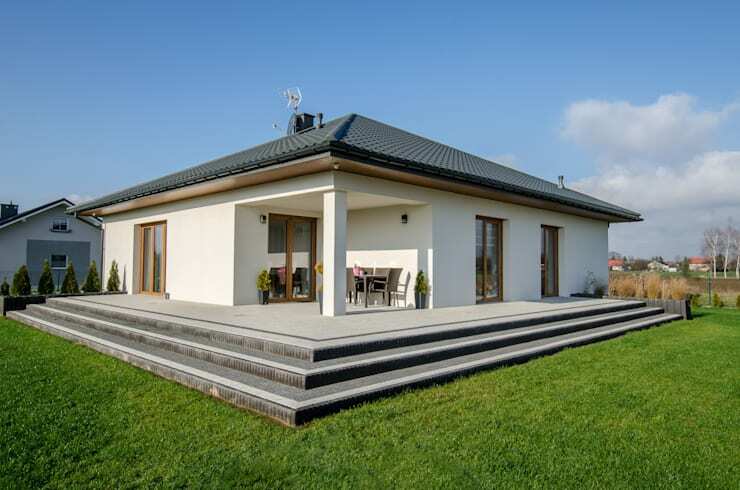 It is inspiring how this apparently simple Polish bungalow conceals stylish and ultramodern elements on the inside. Take another tour for more ideas - A Warm Welcome Into This Vibrant Home.